Find the rhythm of your life and turn it into design inspiration. Amidst a string of public holidays, Easter festivities and school holidays you’re probably desperately trying to catch up on work, while trying to get back into your daily rhythm. You may be forgiven for not realising it’s that time of the year again. 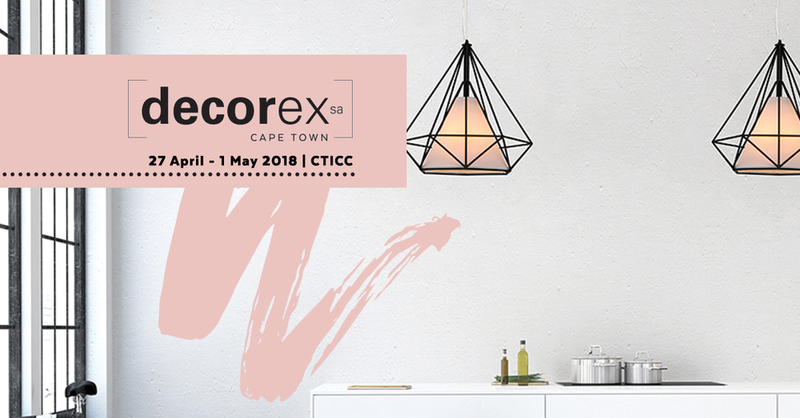 Decorex Cape Town has snuck up on us and if you’re not quick, as in this coming weekend, 27 April – 1 May quick, you may miss it along with all the design inspiration it brings. Just. Like. That. So look sharp and stay seated to find out how you can win a set of tickets, and find out how you can turn the rhythm of your life, whatever it may look like, into design inspiration. This year’s Decorex Cape Town theme is #rhythmoflife and before I tell you what you can expect and how you can win two tickets to the show, I thought we could have some fun and get your thoughts flowing on the rhythm of your life. It may even help you to stay focussed when navigating your way through the décor stalls or any other markets and expo's you may be attending this weekend. Oxford Living Dictionaries defines “rhythm” as “A strong, regular repeated pattern of movement or sound.” My take on a life rhythm then, would be the sounds, activities, places and colours (I’m using some interpretative freedom here) that regularly form part of and make up my life. Sure, you may still be finding your funk and your life may seem just a little out of tune to you, but it’s that melange of events and emotions that often creates the most beautiful works of art. I’m pretty sure my life is the furthers thing from scheduled or rhythmic, but I decided to play around with the things that make up an average week in my life and create a fun, informal design based on that. Breathtaking, right? No, but fun, simple and surprisingly introspective. Here are more of my favourite things, and not so favourite things. You can make your own by following three incredibly complicated steps as detailed in a ridiculously pricey worksheet I have developed over many painstaking months. Just kidding, of course. I’ll send you the super simple, but helpful pdf I used to find my rhythm design if you help me find the rhythm of this blog by answering one question on the content you’d like to see here, and signing up for my newsletter. Incidentally, this is also the question you have to answer in order to be entered into the draw for two tickets to the show. Which types of posts would you like to see on the Tassels & Tigers blog and in your inbox? We will send your Rhythm Of Your Life Design Sheet Shortly. Once you’ve created your design key, visit the Cape Town International Convention Centre, or any other design fare in your area, and find the designs that fit into the rhythm of your own life. That’s the hallmark of a good design after all - both form and function. #1 The She Shed feature, in support of breast cancer awareness NGO, PinkDrive. Vanessa Haywood will be taking part in this feature and according to the event organisers, Cape Contours Landscape Solutions were tasked with transforming a traditional outdoor shed into a women’s haven – reminiscent of the former Man Cave trend. Each designer will incorporate a touch of pink in this charity-driven feature which will raise funds and awareness for PinkDrive. #2 Rooms to Grow. Here Clever Little Monkey and Duett Kids’ Furniture highlight the importance of colour and design in the representation of the individual character of growing children. They’ll be taking visitors through different life stage bedrooms of a child, namely a nursery, a toddler room, tween room and teen room. Also have a look at some beautiful unisex nursery ideas, nursery wallpaper ideas, and a Beatrix Potter inspired nursery.